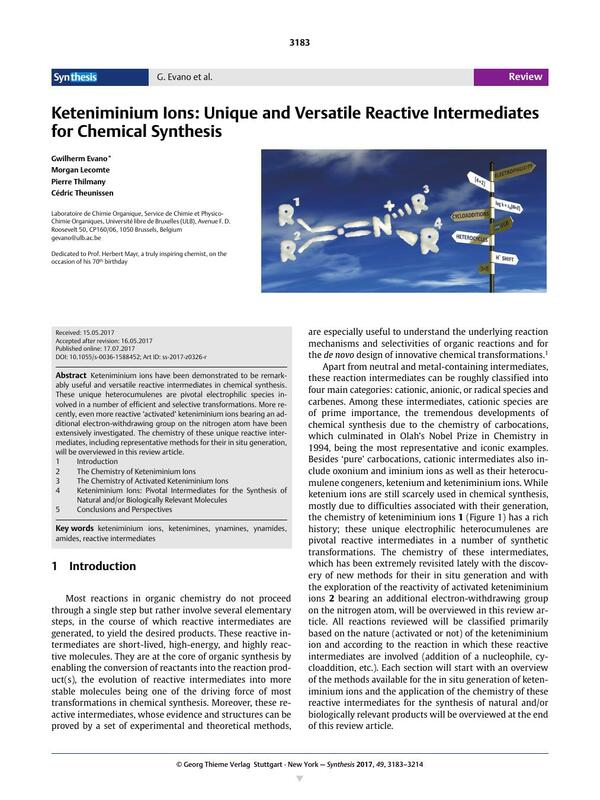 Keteniminium ions have been demonstrated to be remarkably useful and versatile reactive intermediates in chemical synthesis. These unique heterocumulenes are pivotal electrophilic species involved in a number of efficient and selective transformations. More recently, even more reactive ‘activated’ keteniminium ions bearing an additional electron-withdrawing group on the nitrogen atom have been extensively investigated. The chemistry of these unique reactive intermediates, including representative methods for their in situ generation, will be overviewed in this review article. 15 Reactions involving electrophilic activation of non-enolizable amides, which cannot proceed through keteniminium ions, will not be covered in this review article.